This vast square (200 x 100m) has been declared a national monument because of the surrounding buildings and its historic importance. One side is occupied by Palacio de Ayuntamiento (now provincial government). Other important buildings are the Teatro Tomas Terry (1886), cathedral de la Purisima Conception (1833), and Palacio Ferer, from the early 19th century with its distinctive cupola with blue mosaic decoration. 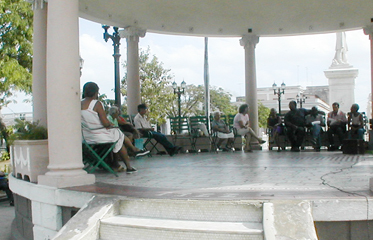 In the middle of the park is the monument to Hosé Martí, a Cuban national hero. We visited this square on Sunday morning and as you can see it was bursting with activities, the local choir was practising in the gazebo, senior citizens with their coach were exercising nearby and a group of youth activists (very usual in Cuba) was meeting in the square.